‘It is not just about the money, it is the experience that comes with it.’ With this as a reassurance, this article presents to you the best and the most expensive hotel rooms, suites and penthouses around the world that will surely leave you crooning for more. With the best views and interiors that surpasses our imagination; this article introduces you into the unknown realms of the unlimited opulence of these masterpieces that might cost more than an average college goers’ entire year’s tuition fees. Make sure to wear your safety belt before starting this journey. 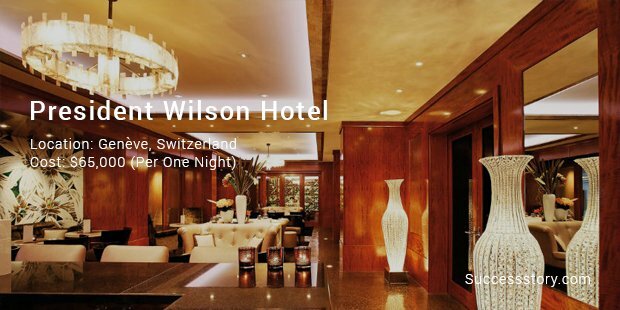 The Penthouse suite of the President Wilson Hotel costs roughly around $65,000 per night. It includes an all in all packages with a spacious lounge area, comfortable sofas, dining table for six, luxurious kitchen with king sized refrigerator and dressing room. It has all the latest technologies including high-definition Bang and Olufsen LCD screen with digital TV channels and integrated DVD reader. Need we say more? The presidential suite of this skyscraper from the Land of the Rising Sun costs $25,000 per night, allegedly. Fretted linens and featherbeds? Check. Sony Bravia bathroom flat screen television set? Check. Fully Stock refreshment bar? Check. 24 hours in-room dining? Check. Indoor pool and fitness studio? Check. Hotel limousine service? Check. This is truly a haven amongst lost paradise. 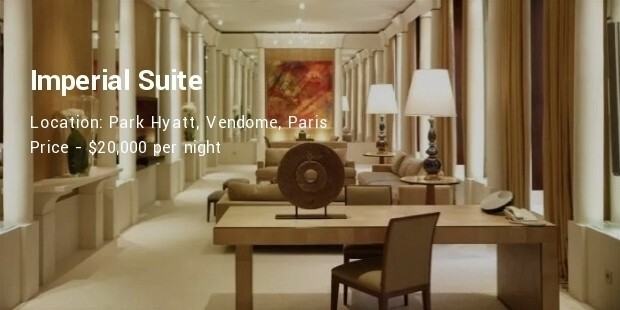 A one night stay at the Maestro Suite will cost you a pocket pinch of roughly $ 18,800. Located at the highest point of the tower, this suite gives you an overview of the magnificence of the Alps and the likes. Each of the bedrooms has an attached bathroom that has sauna facilities. With magnificent interiors for the kitchen and the lounge area, the music of freedom plays here. Truly a maestro’s platform, we say! With a view from heaven, the Chairman Suite of this luxury hotel costs around $17,000. 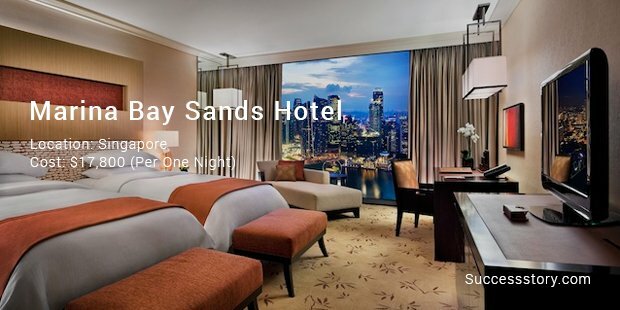 It offers you complimentary breakfast at Sky level 57, access to Sands SkyPark Infinity Pool, access to The Club which is in the same level as the suite, access to the award winning Banyan Tree Fitness Club and not to forget a dedicated team of Butlers at your disposal. 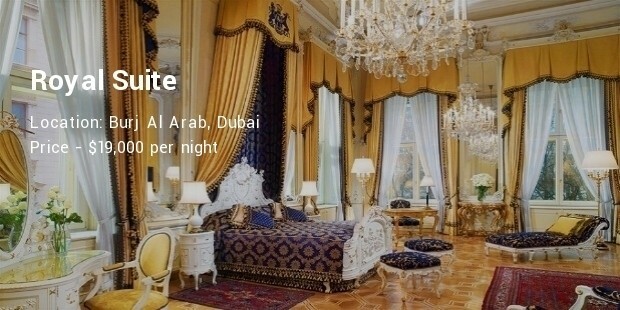 Rooms and suites of the Russian brand of the Ritz Carlton run up to $16,400 per night. Escape to one of the prides of Moscow and witness the magnificence of the legends gone by. 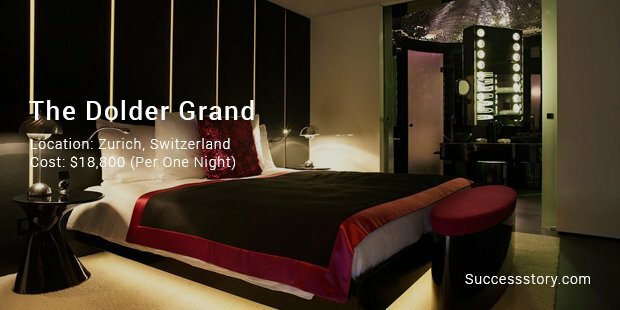 You are adorned with facilities like evening turndown service, fully stocked Honor bar, electronic fingerprints panel for controlling lighting and curtains., lighted mirrors and plush terry robes, complementary high speed internet, in room safe and power outlets for laptops, access to Spa and indoor pool, sauna and steam room. 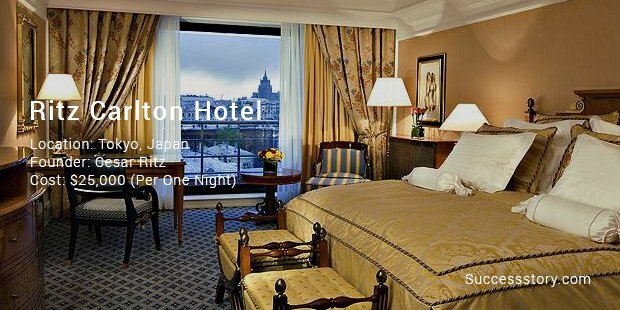 Laundry and dry cleaning services and 24 hour in-room dining. What more does a man require but to lounge on the sofa with a cigar in his hand? 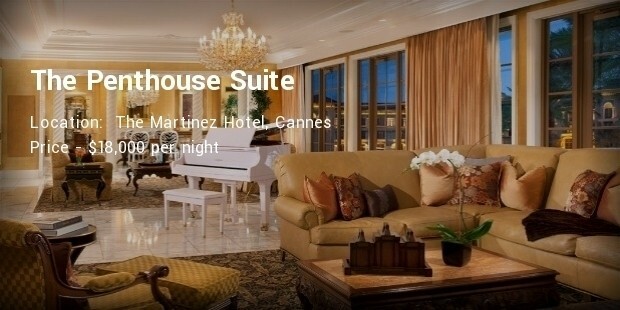 This is the biggest, the most expensive, and the only penthouse suite with terrace , on the Cote d’Azur. Both the suites have a jacuzzi, plasma screen televisions, DVD library, a huge kitchen, an open bar and with a private butler on call any time of day or night . It comes with and an option to join both suites , if need be , into one big huge apartment. The no limit luxury here is reflected clearly when the designs are kept intact in the Art Deco style and with streamlined furniture decorated with silk curtains and smooth polished teak parquet floors. The two-story, 8,400-square-foot suite comes with views of the Arabian sea. A rotating four-poster bed in the master bedroom, dining space , with a private cinema too and an exclusive elevator between the rooms which are at split level. Guests are met by a chauffeur driven Rolls-Royce. With a personal butler in your attendance , 24/7 ready to fulfill every wish. This amazing Royal Suite must be the last word in luxury with a marble and gold staircase, leopard print tufted carpets and Versace linens. 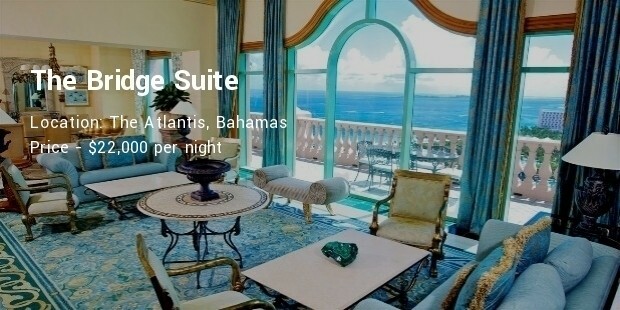 The Bridge Suite , as the name suggests , has to be located on top of the bridge which connects both the Royal Towers buildings, and so it also overlooks the entire resort and marina. A huge 800 sq ft balcony with 12-foot high ceilings throughout and full length windows allow you to have a 360 view of the water, the lagoons and pools in this Paradise Island. 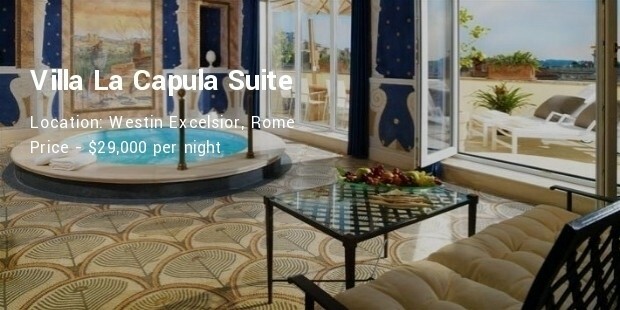 The suite is located on the fifth and sixth floor underneath the cupola of the hotel which was made famous by Fellini’s movies. The downstairs also has a private kitchen, and the dining room features an antique glass chandelier, a just for you, private wine cabinet with collection of over 150 wines to choose from and a study/library covered in hand-crafted wood. But what really makes this suite over the top is availability of a private cinema with Dolby surround sound for watching .